IPPB Assistant Manager Question Paper: The Indian Post Payment Bank is going to announce the vacancies for Manager, Territory Officer and Assistant Manager as scale 1 and Scale 2 in the upcoming months. The selection will be done through the written examination and/ or interview. We will keep you informed about all the related updates regarding the direct recruitment on Bank Jobs. Hence all those who are looking out for the extra study material have come just at the right place. Here we have assembled the IPPB Bank Scale 1 Previous Papers. Also along with them, Model Papers are available which are easy to download as well. Latest Update: IPPB is going to conduct the Assistant Manager written examination 2019 in the upcoming months. 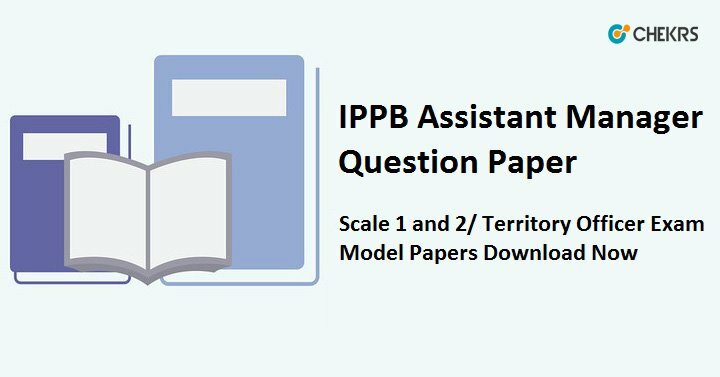 Aspirants can download the IPPB Assistant Manager Previous Question Papers & Model Papers from here. The previous papers are just the right material for those applicants who want to rest assured for their selection. The benefits of practicing the India Post Assistant Manager Previous Papers is that it helps to improve the accuracy of solving questions, gives subtle hints of most important topics, and follow the timeliness. Above all the difficulty level and how to cope with it can also be learned. You can find these papers below in the given table. The model papers are way more different than the previous papers. The sample papers are provided by the teaching experts involved in the field over years. However, their expertise is really beneficial to be used in day to day practice. The regular practice with these IPPB Bank Sample Papers can improve the efficiency for learning the topics of the Syllabus and knowing the possibility of often asked questions. Remarks: If you have any doubts regarding the IPPB Assistant Manager Question Papers, leave them in the comment section and we will get back to you. Also, you can receive the latest job notifications by subscribing our services.